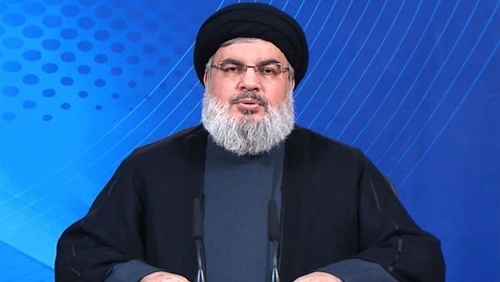 Speaking in a televised address from Lebanon he said, "We, Hezbollah, express our strong condemnation and denunciation of the terrorist attack by the criminals of Daesh in Paris," using the Arabic acronym for IS. 19:00 GMT - Paris Prosecutor Francois Molins announces seven "terrorists" were killed in attacks that caused the deaths of at least 129 people. He confirms that a Syrian passport was found on one of the assailants. He also details how the attackers worked in three teams, striking seven times in quick succession. 19:01 GMT - American Republican presidential candidates are quick to shift the debate to US intelligence and Obama's strategy against jihadists. Senator Ted Cruz said, "We need to immediately declare a halt to any plans to bring refugees that may have been infiltrated by ISIS to the United States." Ohio Governor John Kasich, linked the attacks to immigration of Muslims into Europe and young people not acclimating culturally. "The root cause is this: People have to assimilate," he told a rally Friday, according to The Washington Post. Jeb Bush argues the attacks reignite the debate on intelligence and the role of the US National Security Agency. "What is our counterintelligence capabilities? How do we identify attacks before they happen? What's the balance between our own civil liberties and keeping us safe?," he said in a radio interview. Republican Senator Lindsey Graham, known to be a hawk who does not shy from military intervention, said, "President Obama has got to make a change in strategy" in Syria and Iraq. And Donald Trump, the bombastic billionaire who leads the Republican field in the race for the party nomination, weighed in on Twitter. "President Obama said 'ISIL continues to shrink' in an interview just hours before the horrible attack in Paris. He is just so bad! CHANGE." Trump added, "We need much tougher, much smarter leadership - and we need it NOW!" 19:04 GMT - In the US, three major airlines tell AFP they continue to operate a full schedule to Paris. United Airlines spokesman Luke Punzenberger tells AFP, "We currently don't have any cancellations." Delta, which is a joint venture partner airline to Air France and KLM, said on its website, "All Delta flights scheduled to operate from Paris to the US have departed as of 8 a.m. Saturday." The US Federal Aviation Administration tells AFP it is "closely following the situation and remains in close contact with our security and law enforcement partners." Airbnb tells AFP in a statement: "We have been inspired by the hosts in our community who are opening their homes to people affected by these terrible attacks. If you are able, we hope you will strongly consider helping those who are in need by making your listing available at little or no cost. Also, if you're an Airbnb host in Paris and your Airbnb guest is experiencing travel delays as they try to leave Paris, you can allow your guest to extend their stay for free. Instructions on how to extend your guests stay for no charge can be found below. We will also be reimbursing all of our service fees for any extended or new reservations as a result of these delays for stays on Friday, Saturday, Sunday and Monday." 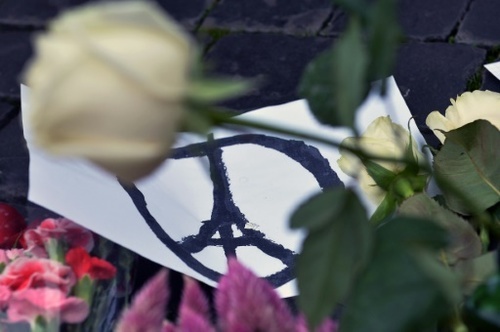 19:06 GMT - A "Peace for Paris" symbol, combining the city's beloved Eiffel Tower with the peace sign of the Sixties, goes viral. "My first reaction was to draw something and share it," he tells AFP. "It was spontaneous. I wanted to do something that could be useful for people." 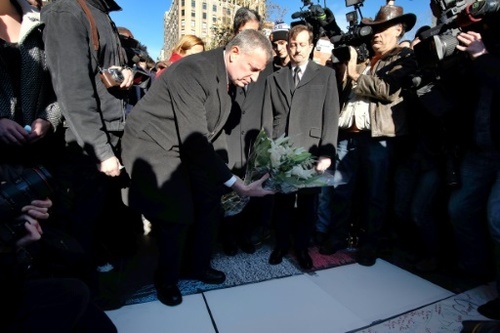 "Given the scale of the violence, the peace-and-love symbol was essential. It was then quite an easy thing to combine it with the Eiffel Tower, the symbol of Paris," he adds. "The two symbols fit together." Jullien posted the combined symbol on his website and then tweeted it. Within hours, it was shared more than 45,000 times and retweeted 76,000 times, including by the British underground artist Banksy. 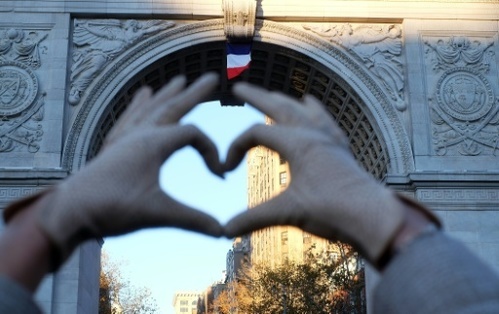 19:08 GMT - New York's Metropolitan Opera led by Placido Domingo mourned the victims of the attacks in Paris with an unscheduled performance of the French national anthem. 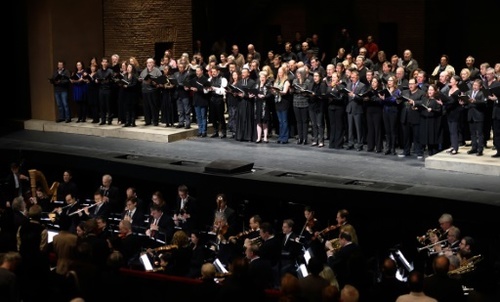 Ahead of a matinee of Puccini's "Tosca," Domingo conducted the orchestra in "La Marseillaise" as the Metropolitan Opera Chorus sang the words in French on stage. A slip of paper was put in all programs at the premier US opera house with the lyrics to the anthem and an explanation that the song was "a show of our solidarity with the citizens of France." 19:15 GMT - California State University, Long Beach (CSULB) confirms that its student Nohemi Gonzalez, 20, of El Monte, California was killed in the Paris attack. Gonzalez, a junior studying design, was in Paris attending Strate College of Design during a semester abroad program. CSULB President Jane Close Conoley said in a statement, "Our university stands with our nearly eighty foreign exchange students from France as they struggle with this tragedy. We will extend all support necessary to comfort them. We will also extend support to all students, faculty and staff who are in need." The US State Department told AFP it "could not immediately confirm the report." - ROMANIA: Two Romanians were killed according to the foreign ministry in Bucharest. - TUNISIA: Two young Tunisians, sisters who lived in the centre-eastern French region of Creusot and who were celebrating a friend's birthday in Paris, were also killed, according to the Tunisian foreign ministry. - BRITAIN: One Briton was killed, the Foreign Office says, adding that a "handful" were feared dead. - PORTUGAL: A 63-year-old Portuguese national, who lived in Paris and who worked in public transport, was killed near the Stade de France sports stadium, according to Portuguese authorities. - SPAIN: 29-year-old Alberto Gonzalez Garrido, according to the Spanish authorities, was killed while attending a concert at the Bataclan theatre that came under attack. - SWEDEN: One person of Swedish nationality was wounded by gunfire and another was killed, according to the foreign ministry, which said it was verifying the information. - UNITED STATES: A US student from California was killed in the Paris attacks, her university says. 19:58 GMT - Our correspondent Jennie Matthew is reporting from a vigil just getting underway in New York. 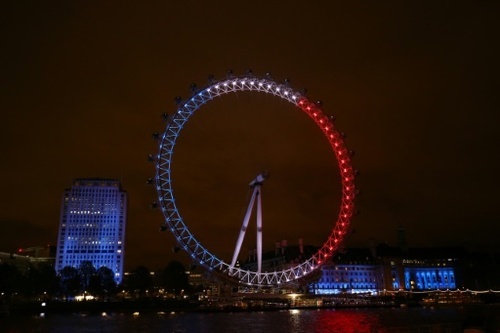 19:59 GMT - As night fell in Europe the Eifell Tower was kept black, but major European landmarks are illuminated in the French national colours. The London Eye, National Gallery and Tower Bridge in Britain, the Brandenburg Gate in Berlin, Germany and Kaknastornet, and the Swedish TV signal tower in Stockholm are all lit up in red, white and blue. Sporting halls joined the movement, including the Friends Arena in Solna, Sweden, and the Ghelamco Arena in Gent, Belgium. 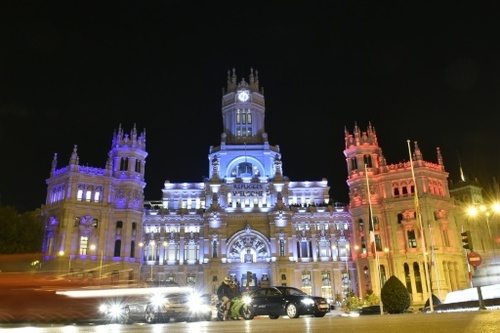 City halls are also participating, including the Cibeles Palace, Madrid's town hall and Israel's capital Tel Aviv. 20:01 GMT - Two men who French police are seeking to trace in connection with the Paris attacks registered as refugees with Greek authorities earlier this year, the Greek police confirm. French authorities asked their Greek counterparts to check a passport and fingerprints of one man and the fingerprints of another. "A Syrian passport in the name of a person born in Syria in September 1990 was found near a suicide bomber who blew himself up at the Stade de France (stadium)," Paris Prosecutor Molins told a press conference. 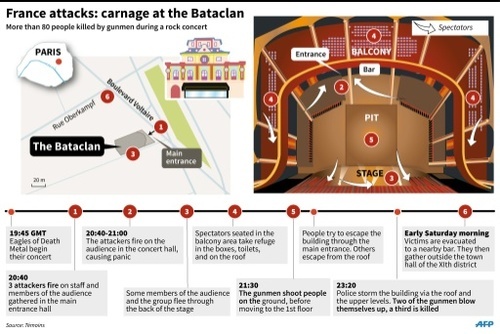 20:14 GMT - Survivor Sylvain Raballant, 42, tells AFP what he saw in the Bataclan concert hall. "I turn around and I see two guys with Kalashnikovs. They were dressed normally: jeans and sneakers. At first I thought they were shooting in the air. Then I saw people falling over," he says. Raballant saw people getting up and trying to escape and decided to do the same. But a fresh burst of gunfire sent him back to the floor with his "head in his hands, near the sound board." "I couldn't move anymore. I tried not to even breathe. Next to me, there was a drunk guy who kept saying, 'We're all going to die.' A couple of us whispered for him to shut up. There were also people who were moaning ... it was horrible," Raballant adds. 20:20 GMT - AFP speaks with Loic Wiels, 33, survivor of the assault on the Bataclan concert venue. "I saw three attackers, two of them clearly. One looked like a young guy, with a three-day beard. The other was closely shaved, wearing small eye glasses and some kind of yellow beret. He was also wearing what I took for a bullet-proof vest. It was actually an explosive vest," says Wiels. He says, "I felt the blood on the floor, the shockwaves of the people falling around me. I got hit with woodchips sent flying by the bullets, but in the balcony nobody realised what was happening." 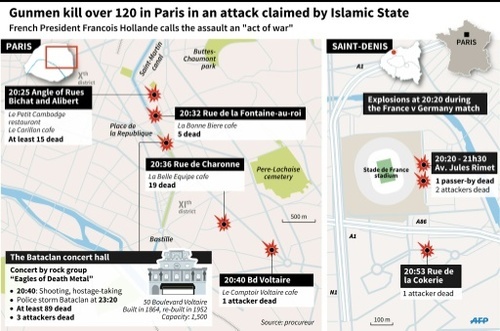 20:27 GMT - Jihadist attacks against France over the past year have been of unprecedented ferocity. 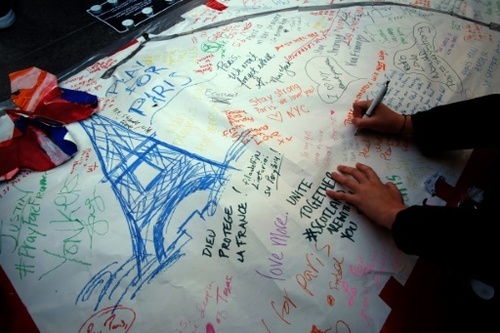 France is "a target due to counter-terrorism activities in north and central Africa as well as the perceived mistreatment of and discrimination against the Muslim minority in France itself," says Matthew Henman, head of Jane's Terrorism and Insurgency Centre in London. France's five million Muslims, Europe's biggest Muslim community, often rightly complain of discrimination, notably on the employment front. "France is the country with the most frustrations linked to Islam," said sociologist Raphael Liogier, adding that was why "more than anywhere else young people are ready to sign up" to radical groups. A total of 571 French nationals or French residents have joined IS in Iraq and Syria, of which 245 have returned and 141 have died, according to official figures. 20:33 GMT - French jets have staged 283 strikes against IS targets in Iraq since September 2014. 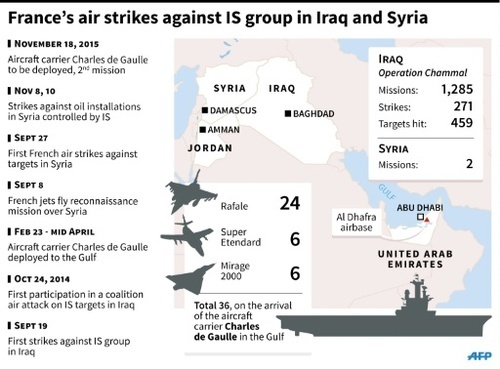 In October 2015, France extended its air campaign to Syria where its fighter-bombers have carried out five strikes against IS training camps and oil sites. Pierre Janaszak, a witness to the attack on the Bataclan concert hall, says he heard the attackers say: "'It's the fault of Hollande, it's the fault of your president, he should not have intervened in Syria'". But Shashank Joshi of the Royal United Services Institute in London says, "I do not believe that French abandonment of air strikes would protect it from attacks, because there would simply be some further alleged provocation that would be cited by future terrorists." He adds the level of sophistication of the attacks meant they were probably planned before France's Syria campaign began. 20:53 GMT - Around 6,000 people marched through Dublin, many participants draped in the French tricolour flag. 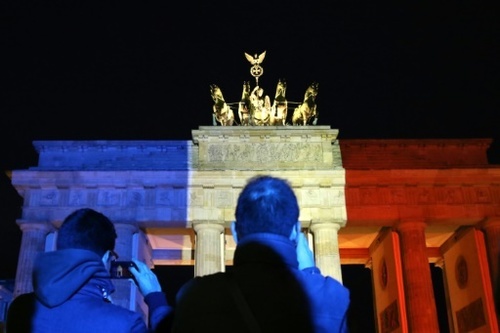 Some carried placards reading "Pray for Paris" and "Je Suis Paris", and others sang "La Marseillaise". The march was initially organised late Friday night on social media by Juliette Charton, 21, a French au pair from Paris living in Dublin, the Irish Independent newspaper reported. "I organised this last night because it's difficult to be in a different country and to hear about your family and friends who are still in danger in Paris," the newspaper reported Charton as saying. 20:56 GMT - Forty-nine armed factions in Syria, including the powerful Jaish al-Islam rebel groups, condemn "in the strongest terms" IS's coordinated assault in Paris. A joint online statement calls IS's actions "criminal attacks that are against (Islamic) laws and human values".